I wrote a SX127x (LoRa transceiver) driver for (Micro)Python on ESP8266/ESP32/Raspberry_Pi. put all *.py into the root directory of ESP8266/ESP32 and it will send and receive packets in half duplex mode. Last edited by Wei Lin on Mon Feb 19, 2018 1:54 am, edited 7 times in total. P.s. is the Semtech SX1276 also Class C compatible? I need no / very low latency for my project and can't seem to find this info on the site of Semtech. Do you also know if it's possible to implement this unit (and this driver) to the Pyboard v1.1? I have no SX1276 nor PyBoard, unable to answer your questions, sorry! and connected one to ESP32 DEVKIT V1 using your code from github and run the example 'DuplexCallback' code. Get no error messages. It seems to run fine. Print out the version it shows version is 0. I exchanged this board to ESP32 and there is no error message. This tells me, the problem is not at the SX1278. I double checked more than once my wiring and cannot find any fault. 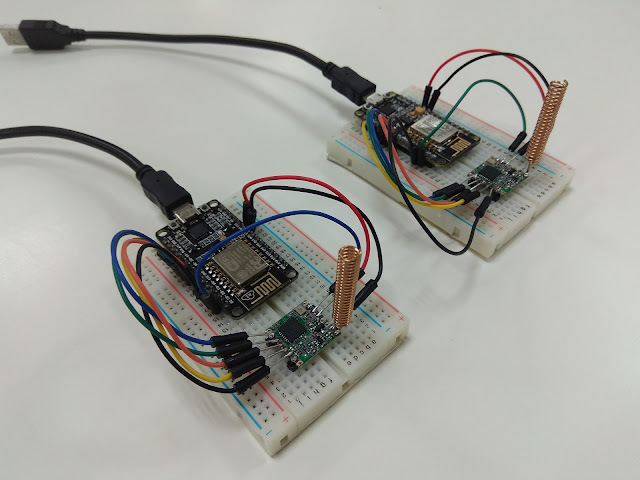 Test runs with MicroPython v1.9.4-8-ga9a3caad0 on 2018-05-11 and with esp8266-20190125-v1.10. Both same result. 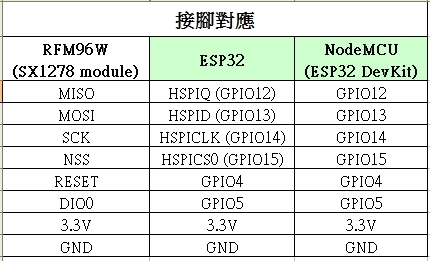 By the way on ESP32 I use also esp8266-20190125-v1.10. Do you have any idea what could be wrong? The error message means that the SPI communication failed. Sometimes it fails after h/w reset until s/w reset. I have no oscilloscope hence not sure why it is so. Last edited by Wei Lin on Sat Feb 09, 2019 11:38 am, edited 1 time in total. the solution is using thicker cable for VCC and GND. ESP8266 3.3V output seems to critical if both modules are driven via a USB cable. Perhaps someone should do the maths How much spare current capacity does the ESP8266 voltage regulator have? How much power does the LoRa device require? Should the LoRa device be powered from a separate 3.3V regulator? 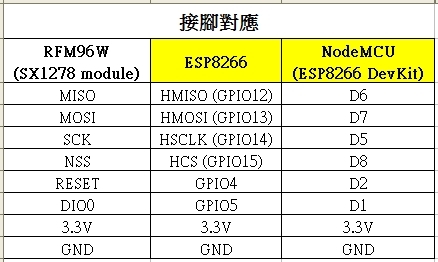 Neither the ESP8266 chip itself, not the ESP8266 modules, have a 3.3V voltage regulator. There is usually a voltage regulator on the development boards, but it varies between the board make and version, so there is no single answer to that.